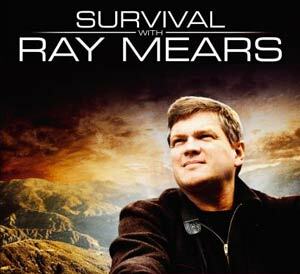 The second episode of the brand new ITV series, Survival with Ray Mears, will be aired this Sunday 25th at 19:00 on ITV1. In the second episode of Survival, Ray tracks bears in the pristine wilderness of British Columbia’s Pacific Coast region. British Columbia houses some of the world’s most beautiful forests, which are inhabited by a healthy number of grizzly and black bears. However, Ray is also interested in the spirit bear. This incredibly rare bear has pure white fur, and is actually a black bear carrying a recessive gene. It is thought that there are only 400 alive today, so finding one will be a daunting challenge for Ray. Ray starts his journey by taking a small plane into the wilderness. He touches down at Klemtu, a tiny fishing outpost, with his wildlife cameramen Shane Moore and Isaac Babcock. They hire a boat and find a remote spot, called Mussel Inlet, where Ray quickly finds tracks of grizzly bears, intent on devouring as much as they can from the annual salmon run, which is in full swing. On his guard, Ray finds numerous grizzly prints that lead him to a grizzly mother and a couple of two-year-old cubs. They play for a while but are suddenly bullied away by a massive grizzly male – a giant that would be about 3m tall if he stood up. The presence of the huge grizzly male leads Ray to conclude that he will not find any spirit bears at the river inlet he has chosen; grizzlies seek out the best fishing spots and defend them ferociously. In order to find the elusive spirit bear, Ray decides that he should first track down black bears since spirit bears share much of the same habitat. Ray searches numerous smaller river inlets in the huge maze of waterways which make up the Pacific Coast. Eventually, he finds an inlet bordered by thick forest. There are several lively black bears fishing for salmon in a river that is brimming with fish. While the 2009 Pacific salmon run was extremely low, the 2010 runs were the largest on record. Over-fishing is most definitely not the reason 2009 was terrible — commercial fishing nets do not catch salmon based on their ‘birth date’. With salmon remaining at sea for 2-4 years typically: how does a fishing net catch all of the salmon destined to return to the salmon grounds in 2009 — and yet miss all of the fish destined to return in 2010? The answer is that they can’t. The answer lies somewhere else. And the simple truth is, we just don’t know why 2010 was a record year. So, let’s not confuse clear science with the muddied waters of anecdotal hearsay. Mother earth is an amazing mystery, as Ray so eloquently points out in every episode. Remember that before we jump on Al Gore’s Global Warming Bandwagon.